The University of Wisconsin- Milwaukee is the state’s second largest institute of higher education and features an enviable list of notable departments, faculty, and alumni. Among the gems that stand out to us here at ACR is its Design and Visual Communications program (DVC) which finds a home in one of the top fine arts schools in the nation- UWM’s Peck School of the Arts. With its 30 year history and deep connections to local and regional partnerships, the DVC program offers a top tier design education that continually evolves to meet the ever-expanding needs of practitioners and industry. Importantly, students take advantage of key partnerships and investments forged between the university and the greater Milwaukee area. Kim Beckmann serves as Associate Professor and Co-Area Head of the program at UWM. Her own field research on the intersection of design, innovation and entrepreneurship has helped to fuel the thoughtful evolution of the DVC program in recent years. For our latest Q&A, we caught up with Beckmann for a more detailed look inside DVC- from its multidisciplinary approach to teaching design, to the way in which students leverage its core values of social responsibility, participation, and outreach. We hope you enjoy! (This interview has been edited for length & clarity). ACR: Kim, UWM’s Design & Visual Communications program has been around for three decades. How has it evolved, and what types of learners does it seek? Kim Beckmann: Our curriculum has evolved over the years to focus on preparing students to be effective design strategists, problem-identifiers, problem-solvers, business partners and proactive community stewards. The competitive field of Design requires practitioners who are empathic, intellectually curious, inventive, dedicated, critical, collaborative, and lifelong learners. To do that, students build a body of work to demonstrate their mastery of tools, media and concepts to effectively communicate ideas to a target audience and design with a user-centric approach. ACR: The DVC curriculum is rigorous and includes many aspects of design. Tell us a bit about it. KB: Our curriculum works as an on-going design laboratory. Risk-taking, experimentation, collaboration, co-creation and productive criticism are central to our program. Students augment their classroom experience with membership in professional design organizations like AIGA, attending lectures, field trips, portfolio reviews, conferences, studio tours, workshops, and much more. In addition to their coursework, they hold real-world internships in local design firms. To be competitive in this profession, students must be engaged in the larger world of design. It requires an awareness of what is happening locally, regionally and globally in design practice as well as design research and design entrepreneurship. ACR: If you compare the pedagogical approach of DVC to your own design education, what aspects are different? KB: The greatest difference for me would be didactic teaching of then versus critical thinking of today. Designers create dynamic stories and experiences. Today’s classroom experience is an exchange of information. Curriculum is designed in a way that students learn by doing. Teachers used to lecture, critique, and spend little time framing projects in which students were encouraged to question. In contrast, the DVC curriculum is framed around design thinking. Students create a researchable question, engage in primary and secondary source research, develop a hypothesis, build a strategic plan to solve the problem, form a team that includes users, collaborate and co-create, and engage in and learn from user testing of rapid prototypes. They are not afraid to fail. They also hone critical communication skills. ACR: There is a strong cross-disciplinary nature to the DVC program, isn’t there? KB: Absolutely! The ability to (re)form and manage multidisciplinary teams with a fearless attitude is critical. Design plays a very influential role in shaping organizations, and that multidisciplinary collaboration is critical to successfully addressing our greatest challenges. Our curriculum was founded on that, and we work actively to enable collaborative, multidisciplinary opportunities for our students within the UW-Milwaukee and SE Wisconsin community. KB: There are many things that students get involved in to augment what they are learning, both on and off-campus. The UWM Research Foundation is a non-profit entity on campus that the DVC program collaborates with often. The Ideas Challenge represents a collection of innovation and design programs and courses that bring out the entrepreneur in anyone, regardless of major. Our students (leverage) their unique skills for companies and startups. It helps connect students to our growing “maker” movement, which will soon have a physical home in The Lubar Center for Entrepreneurship. Our faculty and students also tap into the commercial end of promising research by participating in the UW-Milwaukee I-Corps, sponsored by the National Science Foundation. It’s designed to address the entire process from conception and design to financing and customer discovery. ACR: Additionally, there are various events that showcase student work, as well. KB: Yes there are. The UW-Milwaukee Design Entrepreneur Showcase celebrates DVC seniors’ entrepreneurial talents by presenting innovative products and services that students develop. The projects must address wants and needs not currently being met for Wisconsin residents within the research themes of water, energy, ecology and education. UWM Startup Challenge is an opportunity for students to work in teams and participate in an intensive year-long program to bring an idea to reality. There’s a collective pool of $50,000 available. Teams receive close support and mentorship from UW-Milwaukee’s faculty and The Lubar Center for Entrepreneurship’s team. The Maker Faire Milwaukee is a family-friendly event that welcomes all makers- tech enthusiasts, inventors, crafters, tinkerers, and hobbyists of all ages. They exhibit their work and share insight with other makers. It also showcases the “maker movement”- a growing global community of do-it-yourselfers who push the bounds of creativity, product development and manufacturing. ACR: From 3D imagery to 3D printing, it seems that design drives innovation more than ever. Does our design-heavy era impact what or how you teach your students at UWM? KB: Designers are leaders and business partners in innovation. Our experience with technology is always changing. Design is disrupting billion dollar industries through customer-centric product design. It’s exciting to have so many accessible digital fabrication tools available for our students: 3D printers, laser cutters, 3D imaging software and scanners, and a multitude of forms of communication. This was not the case just five years ago! Students can test ideas much more quickly and pivot just as quickly. We focus on teaching design thinking; we use current technologies and imagine future technologies that will assist in creating desired outcomes that benefit the end user. Our end users are contributing to the design of products and the development of content. Listening, conversing, empathy, and inquiry are critical skills to develop. ACR: How does social impact play into the DVC curriculum? KB: It’s built into the curriculum of all our required courses. I should also say that part of the Department of Art and Design’s mission is a commitment to social justice. This spring I am teaching Typography 2 and our first two projects are focused on how posters work with the United Nations Universal Declaration of Human Rights and human rights violations surrounding the themes of gentrification, migration, and diaspora as the content. ACR: Any interesting things on the horizon for DVC that you’d like to share? KB: Yes! The Design and Visual Communication program will be launching a Master of Arts in Design Entrepreneurship and Innovation in the near future. It will be a 30-credit program with advanced study and two concentrations: Studio Art and Entrepreneurship + Innovation in Design. The curriculum will bridge with I-Corps and Idea Challenge courses, and the student’s plan of studies will be tailored according to their area of specialization and future educational plans. Also, the M3 is a new partnership between Milwaukee Public Schools, UW-Milwaukee and Milwaukee Area Technical College to assist student success in Milwaukee from kindergarten through college. ACR: Exciting times ahead! 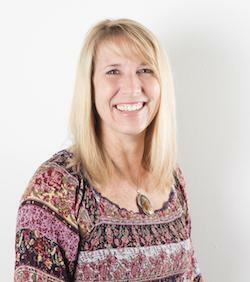 Last but not least Kim, what do you enjoy most about your role as educator, designer and communicator? KB: Great question. What I enjoy the most about coming to class is working with our next change agents. I am fascinated to learn what they are passionate about and committed to sharing with them the skills, knowledge, and resources to help them achieve their goals. I enjoy prodding their curiosity! We explore all possibilities to achieve impactful solutions and I marvel at what students learn by doing. Watching the students’ confidence develop is inspiring. We celebrate success and mentor through failure. All the students contribute to each other’s successes. In DVC when we give out awards the plaque always has a photo of their entire graduating DVC class on it because it’s the group that helped that particular student reach their goal. What I value most in being an educator, designer and communicator is being an empathetic, curious, imaginative, and intentional practitioner. Not to mention I get to do this with incredibly smart and talented people. ACR: All the best to you and the DVC community, Kim. KB: Thank you for the opportunity! For more information, visit the Spotlight on Design & Visual Communications website.